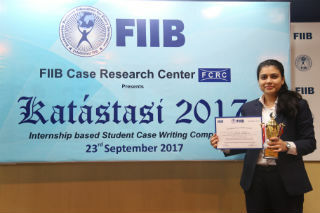 An Internship Based Case Writing Competition Katastasi 2017 was organised by Fortune Institute of International Business (FIIB). This contest was based on Summer Internship Project done by PGDM/ MBA students. The constitution of participating team included a faculty mentor and a student. 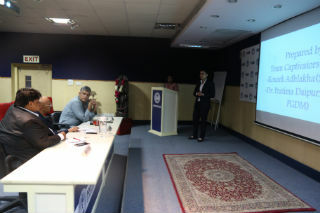 From JIMS, Team Captivator comprising of Dr Pratima Daipuria, Dean PGDM and Ms Konark Adlakha, PGDM 2016-18 batch submitted the case titled “Managing Attrition: The Inevitable Links”. 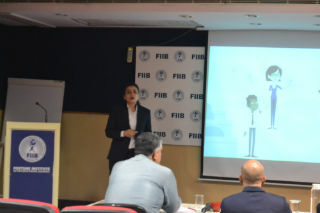 The Case study after initial screening moved to top 10 position and final presentation round was held on 23 September 2017 at FIIB campus. 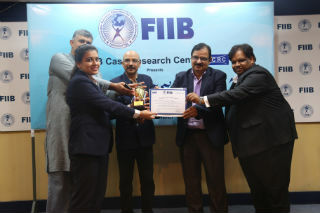 It was a proud moment when Team Captivator bagged first position and was awarded a Trophy, Certificate and a cash prize of Rs 30, 000.These are some of the glimpses of the competition.